This video is said to be leaked by a source in the Italian Air Force. It's quite intriguing to watch and the acceleration of the craft toward the end of the video is incredible. Extraterrestrial or not, it's a craft that appears to run off of gravity drives by the way it wobbles. As I understand it, interstellar craft that use gravity to bend space to travel the vast distances are quite "wobbly" in atmospheres and competing gravity environments. The acceleration would indicate a gravity drive as well. This could easily be one of ours as technology we see is said to be a couple of decades behind what is possible. 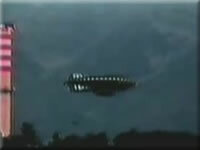 Maybe Lazar's boys did figure that craft out at Area 51's S-4 after his departure. What are the secret governments up to? The video is low quality unfortunately, but this could be due to someone only armed with a cell-phone (possibly for security reasons). Of course with today's CGI, this could be some doctored video of some cheesy RC hovercraft, but for now I'll stick with it's something bigger and better.